TV programs in our life. "WTF Shae!! How can you do that to IMP, he loved you, you fool!! He sent you away because he wanted to protect you from his father." .... those were my words when I was watching fourth season of Games of Thrones. Sometimes I wonder that how come we get so much connected to the programs we watch on Television in such a way that we start discussing or expressing our opinion about a particular character or even start telling them the things as if they can hear us through the TV, lol! Well, if this happens then it's exactly the aim of every producer of TV program to make a mark or space in its viewer's mind so that they think what next and get intrigued to watch their show again. Sometimes, these shows gives you some phrase like "Winter is coming" or "Babaji ka thullu" which unknowingly starts coming out of your mouth when anything about that program comes across you. I think the TV shows like Fiction, drama or comedy are more successful to connect to you because they are insanely planned and thoughted to do that but now reality TV shows has also started to grab viewer's attention or make them wonder what is gonna happen next. I remember, last year we were watching Big Boss season 7 and we used to discuss about the inmates, although we knew that its just a damn TV show but still we were used to discuss about Armaan Kohli, Sangraam Singh and other inmates. While watching the show we formed our own opinion or perception about the different inmates and started to give our judgement about who should stay or who should get eliminated, what is wrong and what is right. I know that this due to the good work done by creative and editing team to hold of viewers to maintain their TRP. I feel that the kind of impact one can have from TV program differs among different individuals, some watch programs just for entertainment and some watch it for information while some watch it to get inspired from it. Whatever the purpose of watching TV is once you own it you can not refrain to turn it on. Few days ago I received an one liner on Whatsapp saying that "5 minutes taken by wife to get ready is equally proportional to 5 minutes taken by husband to come back home from office." Well, I don't disagree with this one liner, in fact I find it very true. It always happens like that, whenever we have to go out I start asking my wife to get ready half an hour before but then she did not, she always says that it will take 5 minutes for her to get dressed and my counter reply is that those 5 minutes are mine so don't you dare to steal those 5 minutes, use your own 25 minutes. She: "Apna mooh kyun nahin dho rahe ho ?" Me: "Haah!! Shero ne bhi kabhi mooh dhoye hein kya". She: "Shave to kar lo." Me: "Babes, that's my masculine look. A light beard gives masculine look :P"
So, it goes like this. It is also said by someone that "What goes around comes around" so same 5 minutes things happen with me when I am in office. She asks on message: "At what time you are coming to the home ?" I say: "Leaving office in next 5 minutes." She: "What happened, nikalne nahin kya abhi tak?" Me: "Bas nikal rha hoon." She: "Hmm!! koi kaam aa gya hoga, hei na?" Me: "Nahin, bas nikal rha hoon"
She: "Accha!! koi desk pe aa gya hoga last moment pe, hei na ?" Me: "Nahin yaar, nikal rha tha to jaate jaate ek colleague mil gya tha" (of course an excuse). She: "Oh haan asusual!! Chalo koi nahin aa jao.."
So, it is like this, you know, what I mean! But, one thing I would like to admit that it doesn't matter how much time she takes to get ready, in the end she always looks perfect and equally beautiful for which I just stop teasing her for taking more time (for that moment only) and just admire her beauty (on that moment). Finally!! after a long time I entered the blogger url to check my account and it looks like that I have missed a lot since my last post in April. Hmm!! quite a lot of things to read. I have a huge backlog of posts from the people I follow, I hope to catch all of'em very soon. Let's see how soon I am going to start writing here or I should say how soon first I am going to finish the posts marked as draft from a long time in my account. I hope to maintain my writing mood long enough this time and I hope everyone is doing great. From the past few days whenever I log in to my blogger account I observed new definitions of alphabets defined by my two blogger friends who are taking part in "A to Z Challenge". It is interesting to see how people can put in their own definition of alphabets inspired by their personal experiences apart from the traditional ones like A for Apple and B for Ball etc. This part continues from my earlier post on Tips and Guide for Linkoping part 1. In due course of time from last year, we (I and my wife) come to know about other information and things which one may be willing to know about. I am continuing this post from the last point of my earlier post. As mentioned earlier this could be one of the hardest part being in Sweden as you need to speak, understand and write Swedish language to get yourself qualified for any open job opportunity. Joining SFI course to learn language Swedish will help you to get acquainted with the language but still it is not something which will lead you to speak, understand and write this language in six months. Swedish government has established an employment agency named as Arbetsformedlingen. As they say, this agency helps you to find the job in Sweden and they have a very good database of job openings as by law employers have to have post job opening on www.arbetsformedlingen.se. So, what you have to do is to visit the Arbetsformedlingen office at Storgatan 6 (across the big Hemkop) in downtown and register yourself there. 1. Plan activities for you. 2. They will ask you to verify your educational certificates through UHR ( more details in the next point) and prepares an activity plan for you. 3. They will ask you to search and apply for the suitable jobs through their website and also to submit your activity report for each month. 4. If you have already joined SFI then they may enrol you for additional Swedish classes (sprak praktik) where you will learn other aspects of Swedish language apart from your SFI classes. The social insurance agency Forsakringkassan pays you some stipend for going to Sprak praktik. 5. They may also enroll you for a job praktik in which you will learn technical Swedish related to your job. Finding a job praktik is as tricky as finding a job but still chances to get a job praktik are higher as compared to job. Forsakringkassan pays you the same stipend for the job praktik as well. Job praktik is a three months training program in which candidate go to a company of his field, do work for them and learn the work culture and technical aspect of Swedish language. The deal here is that Companies don’t have to pay anything to the trainee from their account, its the Arbetsformedlingen/Social Insurance agency who pays the stipend. If company feels satisfied with your work and performance then they may hire you as an employee but in most of the cases they hire a new trainee for next three months and like this way they get their job done without paying anything. Note: Once you get registered at Arbetsformedlingen it is required for you to login to your account frequently to have your account active. Also, try to be in touch with your case officer (handlagare) over the email or ask them to schedule a meeting with you. UHR is a Swedish government agency which works to verify the foreign educational qualifications of the candidates and also assess the level of foreign education as per the Swedish education level. Employment agency asks you to get your educational qualifications verified from them so that employer can know about your educational qualifications and equivalent Swedish education level. Getting your documents verified through them can take up to 4 months to 6 months as they will send verification of your documents to the country from where you obtained your degree. All you need to do is to follow this page "Application form for Recognition of Foreign Qualifications". The cheapest way is to use Swepost (www.posten.se). For first 20 gms only 12 SEK is charged and then 2 SEK/gm is charged, this rate is without tracking. If you ask them to add tracking then it may cost you additional 50-60 SEK. So, its only 12 kr for sending a 20 gm post in any part of the world. When I sent my package to India it got delivered with in one week. With the European Health Insurance Card, you can get compensation for necessary care if you get sick or have an accident when you travel within the EU/EEA and Switzerland. The European Health Insurance Card gives you the right to necessary care at a hospital or doctor's office that is affiliated with that country's national health care system. It is the care provider that determines what is considered to be necessary care. You pay the patient fees that the country's own residents pay. In some countries, you must first pay the entire care cost yourself and then request compensation from that country's equivalent of Försäkringskassan. Immediately present the card together with your ID to the care provider. Everyone in the family, including children regardless of age, must have their own health insurance card. The card is free of charge. Belgium, Bulgaria, Cypress, Denmark, Estonia, Finland, France, Greece, Ireland, Iceland, Italy, Croatia, Latvia, Liechtenstein, Lithuania, Luxembourg, Malta, the Netherlands, Norway, Poland, Portugal, Romania, Slovakia, Slovenia, Spain, the UK and Northern Ireland, Switzerland, Germany, the Czech Republic, Hungary and Austria. You can apply for this card from this link. You just have to enter your personal number on the website, the card is sent to the address that is registered in Försäkringskassan's customer register. The card is valid for three years. Ostergotland county provides a social orientation course for people who have recently arrived in Sweden. 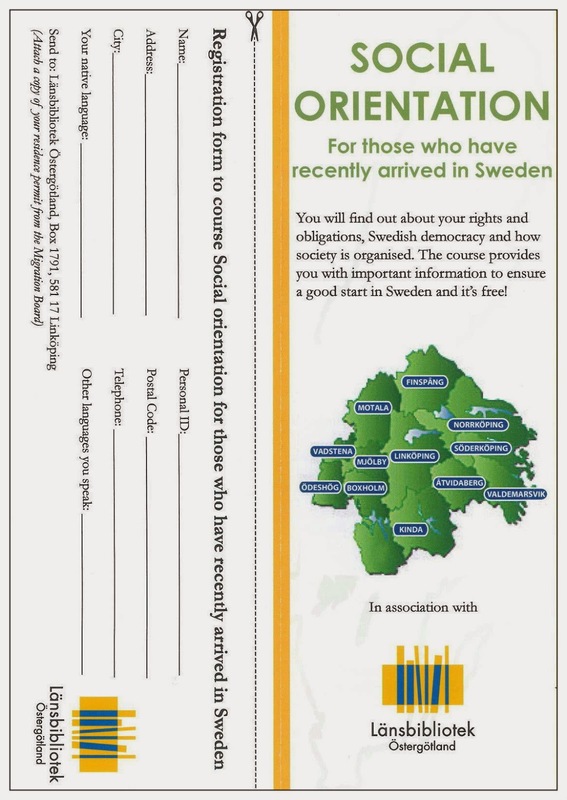 This course is about your right and obligations, Swedish democracy and how the society is organised. 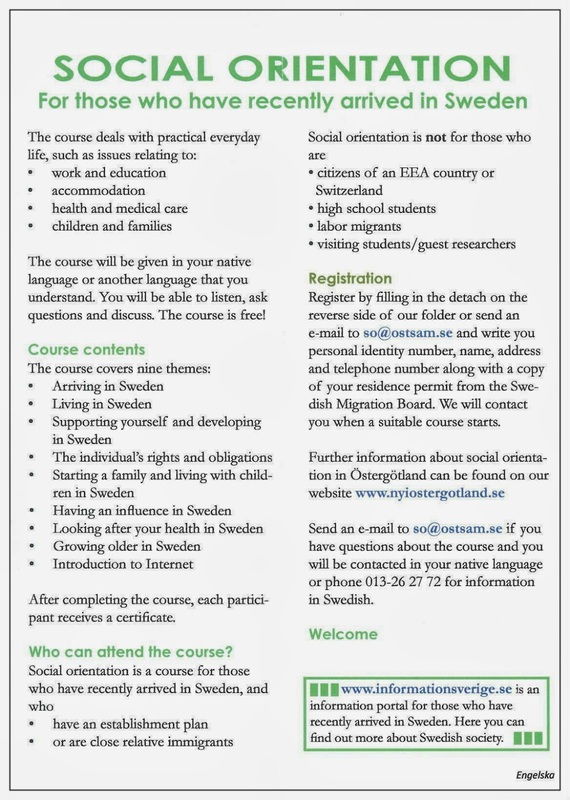 This course provides the important information to ensure a good start in Sweden. Cost of the course: Free, no charge. How to register: Send an e-mail to so@ostam.se with your personal number, name, address, telephone number and with the copy of your resident permit from Migration board. Visit www.nyiostergotland.se and www.informationsverige.se for more information. You can also find more details of this course in below pictures. There are many things to do in Linkoping once you arrive here. For example: You can join a basic swimming course or become a professional swimmer by joining the swimming school (Sim skola) or you can join a photography course on a minimal fees. 1. www.lass.se: Website for events, training and new courses related to water sports. 2. www.studentum.se: You can find higher education in Sweden and abroad. Each training presents the most important information you need to compare different programs with each other such as eligibility requirements, admission points, housing situation, possible costs, etc. Once you find a course you can easily get in touch with the school and ask questions by leaving an interest. 3. www.folkuniversitetet.se: Folkuniversitetet is an adult educational association that offers a wide range of adult education all over Sweden.Folkuniversitetet runs numerous internationally oriented activities such as language courses, courses abroad and projects with an international emphasis. Their brochure in English is available here. 4. www.linkoping.se: Its Linkoping Municpality website on which you can find information about various things. 5. www.studyinsweden.se: This link contains details about free and paid Swedish e-courses. This is a tricky part, finding an apartment here in Linkoping is a bit of hassle especially if you need it in the vicinity of downtown. 1. The best way is to register yourself on the website which I mentioned in part 1 of my blog (available here)as soon as you get your papers to come to Sweden so that you earn some queue points. 2. Other way is to ask your employer/University or concerned person for help. 3. Check with Sky hotel apartments, Sky Hotel apartments provides two type of accomodation, one is the Hotel and the other one is an apartment in the town. There are some apartments in town from Sky which you can rent for 1 month from the rent of 7000 - 10000 SEK/month. These are the furnished apartments with most of the basic facilities like kitchen, bed etc provided. 1. www.transferwise.com: They provide mid market conversion rate and also gives you the option to fix your conversion rate,so, you may get good conversion rate during the rate fluctuations. 2. www.worldremit.com: They have a bit low charges as compared to Transferwise but not good forex rates. 3. www.money2india.com: This service is provided by ICIC Bank and I believe you don't want to go with this option as they don't provide complete Power transfer (Online transfer) option. You have to do half online and half offline transfer i.e. you need to generate the remittance request and transaction reference number from the website and then they will provide you a wire transfer form. You have to wire transfer your money according to the details mentioned in the wire transfer form. If you have bank account with Nordea bank then you can remit money very easily through it. You are new in Linkoping and unfortunately you fall ill, what you should do to find the right health care is explained here. PS: I will keep updating this page with more information which I get in due course of time. I will also appreciate any correction or any new thing which you may want here or should you find any.